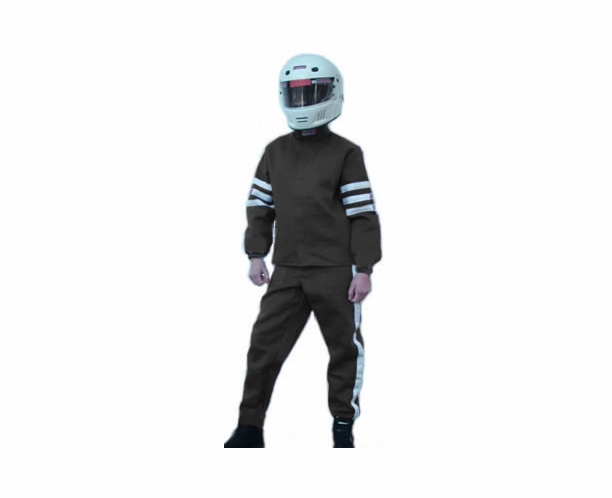 RJS Entry level Professional Driving Suit made with Multi-Layer FR cotton blend fire-retardant outer layer and inner liners. These new driving suits meet and exceed SFI 3-2A/5 standards and requirements WITHOUT the expense of a Nomex® SFI-5 suit! RJS standard style solid color racing suit with 3-1" white ribbon trim upper arm and 1-1" white ribbon trim down leg. Click Custom SuitCustom Style or Custom Fit Turn-Around-Time to see posted turn-around-time for custom style or custom fit suits. Nomex thread, Nomex cuffs and Nomex zippers. Click on Custom Fit if you are not sure about your size, so we can determine your standard size at no charge. Or you can choose to have a professional custom fit for the shown additional charge.